YouGov have done a survey (PDF) into Londoners' Oyster card habits and transport irritations (point of order: why do we never get asked to participate in these surveys?). As you might expect, 76% of us have an Oyster card, with the over 55 age bracket the biggest set of refuseniks. Yet weirdly, less than half of Oyster card owners say they use it more than a couple of times a week - even the ones with full time jobs. 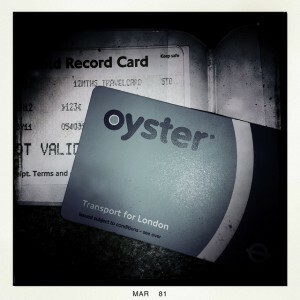 As Londoners, do we consider having a travelcard 'not using' Oyster? Do we have a mental dividing line between what's on the card and simply tapping in and out? The same people who answered YouGov's questions were also asked about their pet transport hates: 70% said they got annoyed by not letting passengers off the train first, but bags on seats, litter, loud music and not offering a seat to an elderly person also scored highly. Some of those came up in our own Top 10 London Annoyances list, and perhaps these Oyster owners might like to remember our number one - stopping in front of barriers to rummage around for that pesky card. Just 8% of respondents had ever used one of the cycle hire bikes, with them proving mostly popular with 18-24 year olds. In other transport news, TfL have released tube performance data for August-September. 'Lost customer hours' increased from 2.1m in July/August to 2.6m - mainly the Jubilee and Victoria lines' fault again - but that's still significantly better compared with the same time last year. Other measures are improving on a year-by year basis: total journey time, station closures and excess journey time. Track-related delays are down, but delays due to signals and points have shot up (174 in Aug/Sep 2010, 224 this year). A figure that might worry the Olympic planners is that more people are using the tube: there were 80.9m passenger journeys in the period the previous year, but 84.1m this year, 700,000 more than TfL's target. Can London's pubs handle this many commuters having a TfL sanctioned pint after work?